DeSantis Gunhide is located in Amity, NY, and was founded by master holster maker, Gene DeSantis. Mr. DeSantis started making gun holsters in the late 1960's. When the company first started, he focused on leather holsters for concealment and some limited law enforcement applications. In time, DeSantis also started producing holsters in ballistic nylon and later, kydex. In addition to Gene DeSantis and his family, DeSantis holsters has also been home to some other premier holster makers. In fact, fellow master holster maker, Greg Kramer of Kramer Leather, worked at DeSantis Holsters from 1970 to 1976. Gene was the first holster maker to design a holster with a locking hole in the holster so a law enforcement officer could leave his weapon holstered and render it safe by running a handcuff through the trigger and security hole. This design has become a standard request for some federal law enforcement agencies. DeSantis was one of the first holster companies to design a nylon pocket holster that used a tacky substance on the outside to keep the holster in place as the weapon was drawn. They were also one of the first manufacturers to offer a tension screw on holsters. Today, DeSantis has models that are in use worldwide by various military units, federal agencies, law enforcement departments, and armed civilians for self defense and concealed carry. In terms of leather, DeSantis offers a black color and tan color. Their kydex and nylon holsters are generally black in color, although their nylon military line also comes in various camo configurations as needed. DeSantis has broadened their gun model offering and now offer models that will fit most all mainstream handguns. IWB is an acronym for "inside the waistband", and it is generally used to describe weapon holsters that are worn in that way. IWB holsters can mount to the belt via a number of methods including a steel clip, leather snap straps, kydex clips, or even velcro. IWB holsters generally offer the best option for concealed carry as the largest part of the weapon is hidden below the waistband inside the pants. While the barrel is covered within the waistline, the grip rides just above the belt. For optimal concealment results, stick with smaller to mid sized weapons with IWB carry. With IWB holsters, you'll find that the larger the pistol, the more difficult it is to conceal. Large framed weapons like a H&K full size USP or Glock 34 will be much harder to conceal than a Glock 26. Single action, single stack weapons such as the Colt 1911 series may be as long barrel-wise as a full size pistol, but the reduced single stack width makes that type of weapon easier to hide. Cant or Ride - This option references the angle that the holster sits or rides while on the belt or waist. Some IWB holsters offer a forward cant ride while others ride straight up and down. Some of the more hihg end models even offer an adjustable cant feature where you can set the cant angle yourself. Bodyshield - A body shield is a special item on the holster that prevents the grip of the handgun from actually making direct contact with the user. This feature can help with comfort as the rough edges of the weapon don't touch the user. 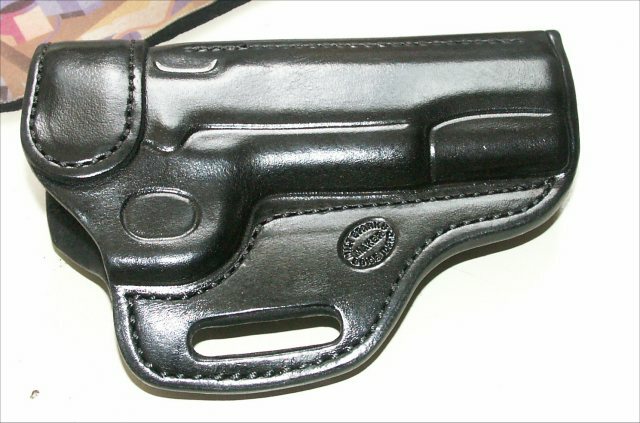 For many leather IWB holsters, the bodyshield is built into the design. Bodyshield or sweatguard - This term refers to a piece of the holster that is built to keep the handweapon from touching the shooter. Most bodyshields or sweatguards are part of the holster design, and are considered a nice option to have.Body shield (also called a sweatguard) - These are special flaps of leather or kydex that serve to protect the user from the rough parts of the weapon. The device "shields" the owner so the weapon doesn't physically come in contact with the shooter. Thumb break - A thumb break or retention strap as it's sometimes calledknown as, is a leather snap strap that fits over the end of the weaponhandweaponpistol or the grip area to keep it in place within the holster. Most retention straps are single ply and featureconsist of some type of button, snap, or release mechanism that has to be activatedinitiated before the weaponpistolhandpistol can be drawnremoved from the holster.Retention Strap - This is a strap that fits over the rear slide or grip of the weaponhandweaponpistol and servesfunctions to keep it in place. Most retention straps requireneed some type of activation so the weapon can be drawnwithdrawnremoved from the holster. In most cases, the retention strap can be released via a snap or button. Retention straps are beneficial for shooters who are active or off duty law enforcement officers.Thumbreak or retention strap - The term refers to a strap or retention device of some sort that keeps the weapon seatedaffixed in the holster until it's ready to be drawn Most retention straps use a snap or other device to release the retention so the weapon can be drawn. Tension screw - A tension is a device that is different from a thumb break. The tension screw is a screw designfeature that allows the draw tension on the holster to be adjusted to the shooter's preferencestastes. Tightening the screw down means that the weapon will need more force to draw it, while loosening the screw makes the weapon draw easier.Tension adjustment screw - A tension screw is usually a single or double set of screws that built into the holster so that the draw tension can be adjusted. This allows the draw tension to be set to the users personal preferences.Tension screw - This refers to a screw or set of screw adjustments that allow the draw tension to be adjusted. The tension screw or screws give the shooter the ability to tighten or loosen the tension of the draw. If you are still trying to find a good concealed carry holster for your weapon, you might want to try an IWB holster as it can be an excellent option.Used with an appropriately sized weapon, an IWB holster can be an outstanding choice for conceealed carry. IWB holsters provide a good, stable platform for concealed carry as they allow the weapon to remain concealed within the waistband. Having owned a gun store for almost 15 years now, I'm amazed to see customers who constantly switch handguns looking for the "perfect" CCW weapon. I had a customer just recently come into my shop and trade in the last handgun he purchased from me about 3 months ago. This was about the 15th pistol that he traded in. As we started talking about various new handgun models, it became apparent that he was looking for that perfect blend of caliber, size, and mechanics for a concealed carry weapon. The truth is, I don't think a "perfect" CCW weapon exists. Each shooter has different preferences as to what they are looking for. Smaller pistols generally tend to be easier to conceal, but they offer less firepower and can be more difficult to shoot for people with large hands. My suggestion is to find a handgun model that meets your personal needs in terms of caliber, size, and shootability. Come up with a conceled carry method that works for you and then stick with it. I've been carrying a Glock 26 for years as my primary CCW weapon. It meets all my needs and I can shoot it fairly well. Enough said. 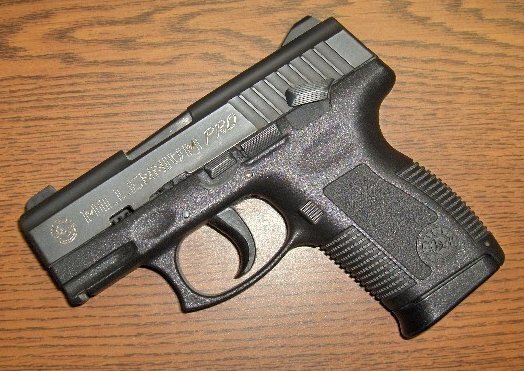 Introduced to the market by Taurus Manufacturing in 2005, the Millennium Pro model was intended to be an upgrade over the standard Taurus Millennium series. Like the Millennium series, the Pro series was specifically designed to target the civilian concealed carry, self defense, and law enforcement markets. The Millennium Pro is a striker fired, double/single action handgun with a polymer frame. Taurus is now offering the slides in a blued model, stainless steel, and the new titanium (designed to further reduce weight). The Millennium Pro series is produced in a .380, 9mm, .40 cal. S&W, and .45 ACP calibers. Regardless of the handgun caliber, all Mill Pro weapons a double stack magazine. The magazine capacity varies between 6 and 12 rounds, depending on the handgun model and specific caliber. The Millennium Pro is generally considered the 3rd generation of the Taurus Millennium series. While each of the generations looks similar, they are fairly different. However, the largest differences can be found in the Mill Pro series as compared to the first two generations. The Millennium Pro model has a number of enhanced features including a higher magazine capacity, lighter frame, more ergonomic grip, loaded chamber indicator, integrated accessory rail. From a holster perspective, nearly all the PT Millennium Pro series are built on the identical frame (PT-111 Mill Pro, PT-140 Mill Pro, PT-145 Mill Pro). As such, most any pistol holster for any of these models will fit any of the other models. For example, a holster for the PT-111 Mill Pro will usually also fit a PT-140 or PT-145 Mill Pro. It's important to point out that there are significant design differences between the Mill Pro series and the standard Millennium series that will impact holster fit. As the Pro series had an accessory rail and the standard Millennium series doesn't, the holsters are not interchangeable between the two. A holster for a Mill Pro series will most likely fit a standard series, but not vice-versa. Personally, I've found the Taurus Millennium pro series to be an first-class value for the money, offering features and performance that are generally found on more expensive handguns. 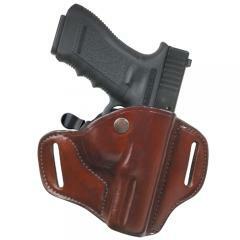 A lare choice of holsters for this weapon can be found here:=> Taurus Millennium Pro Holsters. Unless you are completely new to the holster game or you've been living under a rock for the last 20 years, most shooters have heard of Milt Sparks Gun Leather. Sparks is considered a premier custom holster maker that specializes in concealment holsters. They make a number of very nice models, but today I'd like to focus on the Sparks 55BN holster. In addition to the cant, the belt widths are customizable as well coming in a 1.25", 1.5", or 1.75" set-up; depending on your gun belt. Two of the things that I really like about the 55BN include the built-in metal strip that keeps the mouth open all the time and the handboning for a perfect fit. I've had a number of Sparks holsters and it amazes me that they seem to ready to go upon arrival with little to no break-in. Like most every holster that Sparks produces, my biggest complaint with the 55BN is the wait time. I understand that quality takes time, but I'm pretty impatient and have trouble waiting 12 to 16 months for a holster. Sometimes, it takes so long, that I forget about the order until it arrives. The Kel-Tec P-11 was brought to the market in 1991 by Kel-Tec CNC in Florida. Like most of the other Kel-Tec pistols, it is produced for the concealed carry and self defense market. Kel-Tec hired Swedish designer, George Kellgren, on board to create the P-11 design. Kellgren is best known for his prior firearm designs with Intratec. To reduce weight and mass, Kellgren designed the P-11 frame from a polymer material but kept the slide, barrel, and internals metal. In turn, the P-11 weighs a mere 14 ounces unloaded and around 20 ounces fully loaded. The P-11 was designed to shoot 9mm rounds and the factory magazine carried 10 rounds. Kel-Tec later offered an aftermarket extended 12 round mag that incorporated a pinky extension. For a very short period of time, Kel-Tec also offered variants of the P-11 that were chambered for the .40 cal. (called the P-40) and the .357 Sig (called the P-357). These higher powered variants proved to be hard to control and shoot so they were discontinued after only 2 years of production. Marketed as the lightest 9mm handgun currently in production, the P-11 makes a great choice for concealed carry. It works well in a number of gun holster configurations including IWB, on the belt, and on the ankle. About the only carrying method that may or may not work would be pocket carry as it's a little big for most pockets. In terms of CCW pistols under $300, the P-11 is a clear winner. The 10 or 12 rounds of 9mm is enough firepower to deal with most two or four legged problems, and the 20 ounce weight means you can comfortably carry it all day. My only real issue with the P-11 is the heavy trigger that Kel-tec sets at a hefty 9 pound pull. Aside from that being a little too heavy for my tastes, I think the P-11 is a steal. For information on holsters for this weapon, try here:=> Kel-Tec P11 Holsters. Founded by Tim Wenger, Blade-Tech is based out of Washinton State. They only produce holsters from kydex. At that time, kydex was new to the handgun holster market, but Blade-Tech saw the potential for kydex holsters. Blade-Tech offers an entire line of holsters, mag carriers, and flashight carriers in kydex. Being one of the first holster companies to ever market kydex holsters, Blade-Tech built an excellent reputation in the kydex holster industry. Blade-Tech offers two different lines of products within their products. The orginal kydex line was produced using sheets of kydex that was handmolded. The newer Blade-Tech line is less expensive as it utilizes injection molded kydex versus sheet molded. Blade-Tech holsters offers two different lines of products within their products. The orginal kydex line was produced using sheets of kydex that was handmolded. The newer Blade-Tech line is less expensive as it utilizes injection molded kydex versus sheet molded. Taking care of a leather holster is really very simple, but it seems to be the most common reason that holsters go bad. Leather is an organic material and it does neet just a bit of care to make it last. The easiest way to take care of a leather holster is to apply a nice coat of paste wax or neutral colored show polish to it at least twice a year. This provides the leather with just the right amount of moisture and coats it in a protective layer of wax. Once the wax turns a hazy color, simply buff it off with a clean cloth ot horsehair brush. Be wary of leather cleaners and leather treaments as they contain chemicals designed to soften leather. This will ruin a good holster quicker than anything else. One or two coats of a "cleaner" and the holster will stop retaining it's form. Stay away from Mink oil, Neatsfoot oil, and saddle soap as they all contain a leather softening agent. If you aren't sure about what to use, stick with good old fashion paste show wax. It works great and is very inexpensive. Few weapon holsters have been as widely glamorized by various movies and TV shows as shoulder holsters. Shoulder holsters can be traced all the way back to the days of the old west as handgunslingers and lawmen used them as a means of carrying a smaller or secondary handhandgun on their person. Historians that specialize in old west history have found evidence that a number of famous wild west personalities like Don Holiday and Bat Masterson were known to carry a shoulder holster at some point. Any information on shoulder holsters would be doing an injustice if no mention of Miami Vice was made. This 1980's television series brought a resurging popularity of shoulder holsters as a shoulder holster was worn by one of the main characters. Shoulder holsters are designed to carry a handpistol in a holster that is generally suspended under the armpit. Some of the newer generation shoulder holsters that are made for long barreled or scoped revolvers across the chest, although the harness itself is still worn over the shoulder. The harness itself is usually made of a single or double loop that rides over one or both shoulders. The harnesses come in several different configurations including a full harness, half harness, or executive harness. The full harness has dual harness loops so one loops over each shoulder. The half harness has a single harness that loops over one shoulder. The executive harness is really only designed to support smaller handweapons. It features a single loop that doesn't fully go over the shoulder and connects to the belt. Vertical carry - In this style, the holster itself rides vertically on the body. The muzzle of the handhandgun rides either straight up or straight down. In most cases, the muzzle rides in the downward position, but there are a select few models where the muzzle actually rides up towards the armpit. The models where the muzzle rides upward are generally restricted to small, short barrel revolvers like the S&W J frame series. Horizontal carry - The holster itself rides horizontal to the body so the barrel points out underneath the armpit backwards from the body. This is probably the most popular style today as it will fit most any semi-automatic weapon. Chest Carry - These are somewhat of a specialized shoulder holster where the holster itself rides in the front of the chest while it is still supported by loops that go over each shoulder. This style is very popular for hunting revolvers that have a long barrel (over 6") or are equipped with a scope. Shoulder holsters can be a good choice for handweapon carry in certain applications. For long barreled revolvers or hunting handhandguns equipped with optics, it may be the only choice. For concealed carry, it can be very effective as long as you are prepared to wear a cover garment. The trick to shoulder holsters is being able to honestly evaluate your carrying needs and then determining if a shoulder holster will meet those needs. Known for both concealed carry holsters and law enforcement gear, Gould & Goodrich Holsters has been in business since 1981. Located in eastern NC, Gould & Goodrich was originally owned and operated by a subsidiary of S&W. The plant produced duty holsters and law enforcement accessories under the S&W name. In 1984, S&W decided to step out of the holster business and the plant was sold to a partnership called Gould & Goodrich. Since that time, Gould & Goodrich (more commonly called G&G) has been producing holsters that are used all across the world. Gould & Goodrich (G&G for short) is probably best known for their law enforcement gear, which is in use all across the U.S. as well as internationally. Within the last few years, G&G opted to enter the concealed carry market. The line of CCW holsters that they offer is rapidly growing and features some unique designs. Probably the most popular designs they offer include the B891 clip-on and B890 belt slide. Unlike some holster production companies who may take 6-8 weeks to get a holster manufactured, G&G seems to have a very efficient process as they can usually have a holster completed in under 4 weeks. Introduced into the market in 2001, the Beretta 9000S pistol was a number of "firsts" for Beretta. It was the first pistol that they had specifically designed for the U.S. concealed carry market. It was also the first polymer frame pistol that Beretta had ever produced. Finally, it was the first pistol that Beretta had ever designed that would operate and fire as a single or double action weapon. Past Beretta handguns had been constructed from steel, but Beretta knew that they would have to reduce the weight on the 9000S to make it a viable concealed carry weapon. They did that by producing the frame from a lightweight technopolymer that was reinforced with fiberglass. To further strengthen the frame, it also features two special steel alloy rail inserts that guarantees slide-to-frame fit. In 2001, the .40 caliber S&W version was released to the market, and the 9mm model was released the following year. The .40 cal. model carries 10+1 while the 9mm model carries 12+1. In order to be attractive to existing Beretta pistol owners, the 9000S will also accept a 9mm or .40 cal mag from the larger Beretta 92 or 96 using a special grip sleeve adapter insert from Beretta. The 9000S magazines also feature a proprietary lip design that incorporates a extending lever into the magazine floor. This will allow shooters with larger hands the option of extending the mag with the flip of a switch. Originally, the 9000S was produced in a double action only configuration. This model is commonly called the 9000S-D version. In 2004, Beretta released a new variant of the 9000S that would function in both a single and double action mode. This model was called the "F" version. The F model could be carried and fired in the hammer down position or the cocked and locked position that was commonly found on Browning weapons like the Hi-Power or 1911. The F model was equipped with a decocker/thumb safety that allowed the pistol to be carried with the hammer back, and also allowed the hammer to be decocked. All 9000S models are built with a block in the firing pin that prevents a discharge without the trigger being activated. Like many other handguns on the market, the 9000S is easy to field strip and breaks down into 4 components. All the components are large so the shooter won't lose any parts or have to be concerned with any small springs. Reassembly takes a matter of seconds and the weapon is battle ready again. A pocket holster is a small holster designed to carry an equally small handgun in a front pocket, trouser pocket, or jacket pocket. Provide a safe method to carry a weapon in the pocket - Covering the trigger area, not only protects this area during your draw, but it also keeps debris out. Conceal the weapon - A properly constructed pocket holster should break-up the outline of the weapon in the pocket, and minimize printing. Make the weapon readily accessible - The pocket holster should be wide enough to keep the weapon in an upright, accessible position within the pocket. Allow for immediate and deployment- It should allow for quick access, a full firing grip, and quick weapon deployment from the pocket. What are pocket holsters made of? Leather - About 80% of all pocket holsters on the market are made from leather. Some manufacturers use a stiff grade leather, while other use a softer style leather. The stiffer leather tends to be thicker in width, which can add to the overall bulk of the holster. Nylon - Many of the lower priced pocket holsters are produced from nylon. Personally I don't feel that nylon isn't really strong enough for the daily rigors of a pocket holster, and feel that it lacks the rigidity to properly break-up the weapon outline. If you're on a really tight budget, than nylon pocket holsters are definitely going to be something for you to consider. Kydex - As kydex continues to evolve in holster applications, a select few manufacturers are now using it to produce pocket holsters. As kydex is significantly more rigid and stronger than leather or nylon, the kydex pocket holsters tend to be very thin. Concealability is an absolute must for CCW. Pocket holsters are specifically designed for and work best with small handguns. Please be realistic with your concealment expectations. It's going to be almost impossible to conceal a Beretta 92 in a front pocket holster. Choose the right size weapon, and pocket carry becomes much simpler.